The Chronograph watch-inspired instrument panel from the Lexus IS200, IS300. 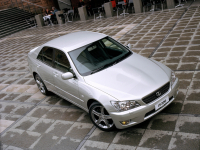 2003 Lexus IS300 Platinum Limited Edition. 2004 Lexus IS300 Sports Luxury Interior. 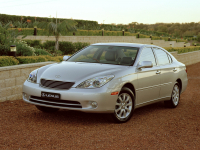 The Lexus dust and pollen filter (standard across the range) eases seasonal allergies, including reactions caused by high-pollen non-native Plane trees, popular in Australian cities, IS200 Sports Luxury (pictured). Lexus breaks 600 sales, and celebrates its best September and third quarter result on record. 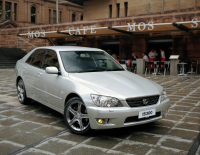 Just three months after its introduction in Australia, the Lexus IS300 Sports, pictured has contributed to a year-on-year IS line sales increase of 143 per cent. 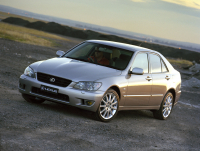 Lexus ES300 upgraded interior includes new perforated leather trim and heated/cooled front seats, three-spoke steering wheel and two new interior leather woodgrain combinations. A realignment of the Lexus IS line includes a significant specification upgrade across the model lineup and the introduction of a new IS300 Sports model (pictured).